ACT Ohio advocates for the use of Project Labor Agreements (PLAs) and other similar agreements like Memorandum of Understanding (MOU), and Community Benefit Agreements (CBAs); tools that help ensure taxpayer dollars stay in the community by requiring that highly-trained and skilled local workers be used on government projects. Highly skilled labor completing the project. A properly trained workforce, reducing accidents and injuries. Establishment of uniform work and pay schedules. Agreements by workers not to strike or conduct work stoppages. Insurance that major projects will not be delayed by a shortage of qualified workers. Fair competition among contractors by standardizing labor conditions. Streamlined negotiations for complex projects, reducing costs along the way. The Ohio Apprenticeship Council has 12 registered Building Trades Apprenticeship programs. Each program includes, at a minimum, 2,000 hours of structured on-the-job training and 144 hours per year of related classroom instruction. These programs produce a pool of workers who have been highly trained to industry specifications and are able to safely complete projects on time and on – and often under – budget. Since 1997, over 160 PLAs have been signed in completing more than $37 trillion in work throughout Ohio. Schools, parks, roadways, and museums are just a few of the projects completed in communities where local craftsmen and women completed the work, thanks to PLAs. Ohio’s metro cities and small towns have all realized the advantages of using PLAs. 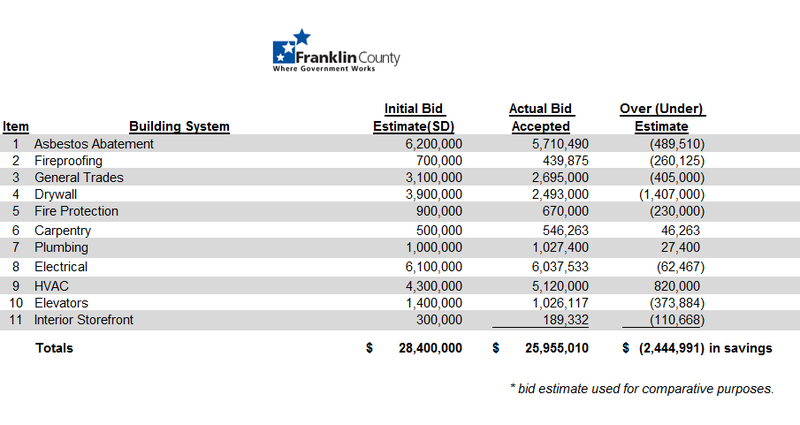 By securing a Project Labor Agreement on the construction of its 237,500 square foot Hall of Justice, Franklin County was able to save taxpayers $2,444,991 by using a highly-trained, local workforce. Newburgh Heights executed a $2 million PLA in the construction of their fire department, and kept the work – and the dollars – local. – Industry-trained skilled craftsmen and women complete the work. – A highly-trained workforce reduces accidents, injuries, and death on the job. – It is good business. Using local workers supports the local economy. – Projects come in on time and on or under budget, with no work stoppages. – It is good economics. Projects utilize highly-trained workers, getting the work done efficiently and correctly. – Uniform work and pay schedules and labor conditions. – It helps build the local economy. The work and tax dollars stay in the community. 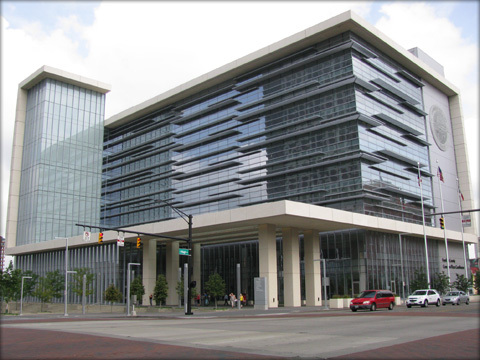 Franklin County’s Hall of Justice, completed in 2015, created 175 Ohio jobs for the Building Trades by using a Project Labor Agreement. By using a highly skilled local workforce, 82% of the contractors used were able to bring their portion of the project in significantly under budget for a total savings of over $2 million for taxpayers, using a highly-trained, local workforce.